This recipe came from a neighbor and family friend we’ve known since we were little. Our family has been making these for years. They are gooey and chocolatey. Enough said. Preheat oven to 325 degrees F. Combine all dry ingredients in medium bowl and mix together with a spoon. Add melted butter and mix haphazardly to temper the mixture. Add eggs and mix thoroughly, making sure to scrape the bottom of the bowl to incorporate any dry ingredients that may have settled. Pour batter in a 9x13 glass pan, smooth top and bake for 50 minutes at 325 F (mine baked for 45 minutes). When a toothpick comes out clean, they’re done. Immediately upon removing them from the oven, scoop marshmallow creme in heaping tablespoon amounts across the surface of the bars. Make sure to scatter and stagger your plops (you will see in the picture). Don’t be tempted to spread them. Allow the marshmallow creme to melt down for a few minutes. When the marshmallow creme has melted and spread out a little, take a butter knife and gently spread the creme into areas that it has yet to touch, creating an even layer. Set aside to cool. 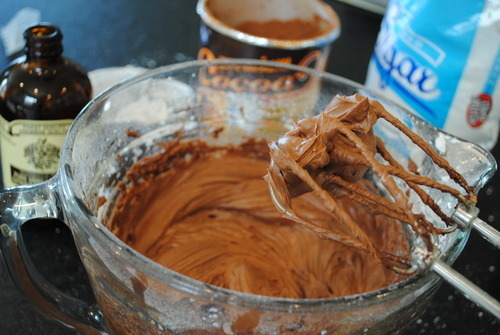 Now it is time to make the chocolate frosting. 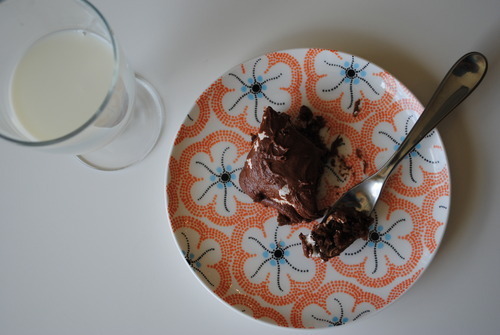 Note: I have never followed a recipe when it comes to frosting. This is the way my mom has always done it, so I have learned from watching her. For the sake of this post, I wrote down the measurements as I went. 6 tbs butter, room temp. With a hand mixer beat butter for at least a minute or until a fluffy texture is reached. Add powdered sugar and cocoa. Beat thoroughly for at least 2 minutes. Add vanilla and continue to beat. Pour in milk a tablespoon at a time until spreading consistency is reached. 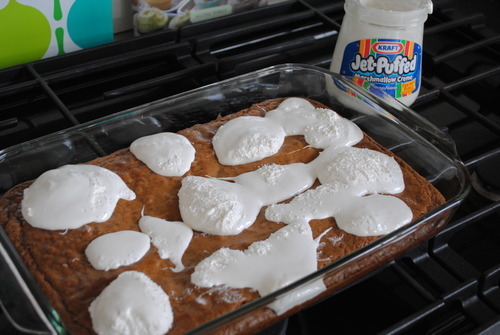 Take your pan of bars and frost over the top of the marshmallow creme. 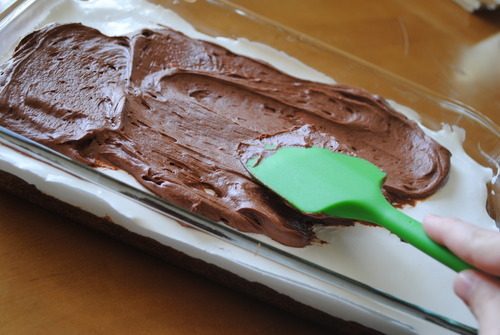 You can decide how thick or thin you want the frosting to be. 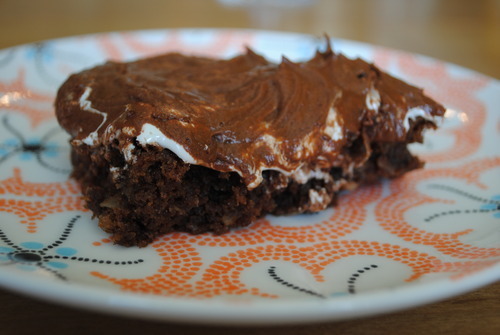 Keep in mind that too thick a layer tends to overpower the brownie/bar. Note: You will most likely have frosting left over. Devour them with milk. Ya just gotta.